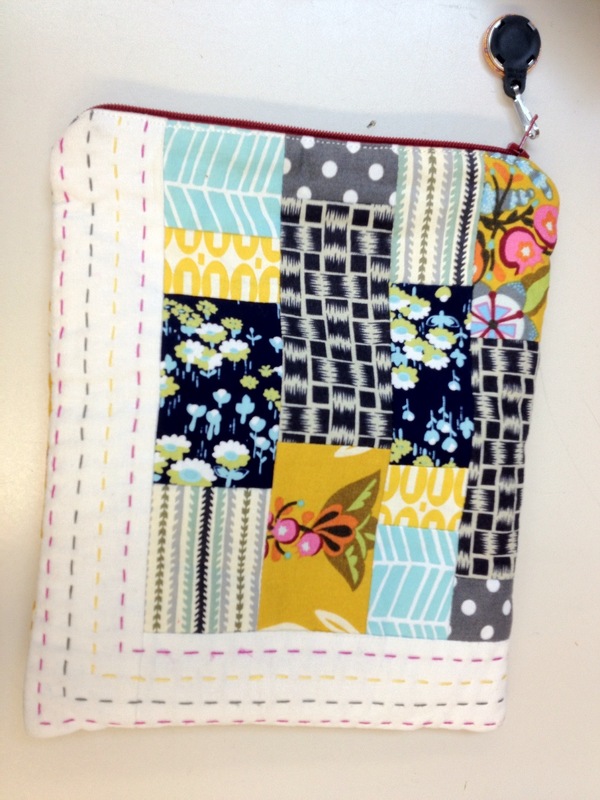 I was inspired by this pouch that Lynne had at the DC Modern Quilt Guild meeting on Saturday. She was given this as a swap item. Pretty great, don’t you think? 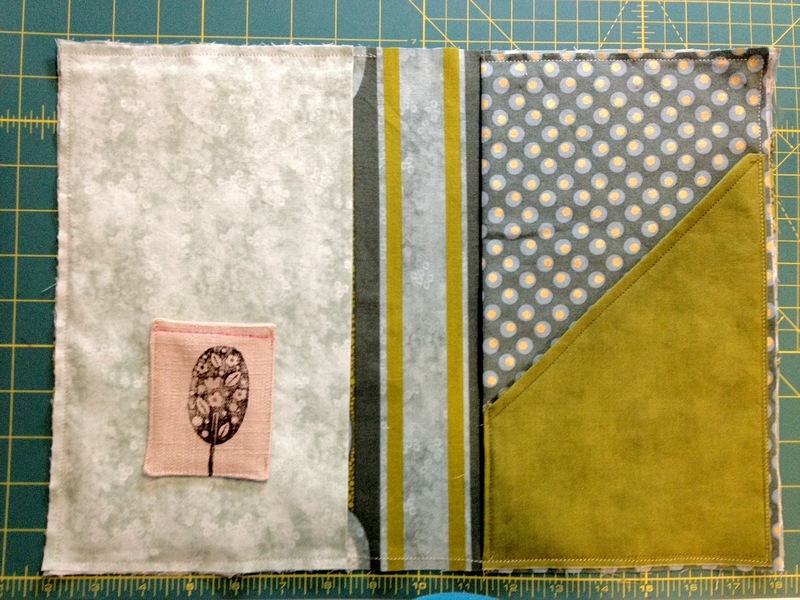 Fabric notebook covers are my “go to” item if I need a quick gift. I made a ton of them for Christmas gifts this past year. My quilt guild, Needlechasers of Chevy Chase, has made many of these to sell in our boutique at our next quilt show and that is how I first learned to make them. 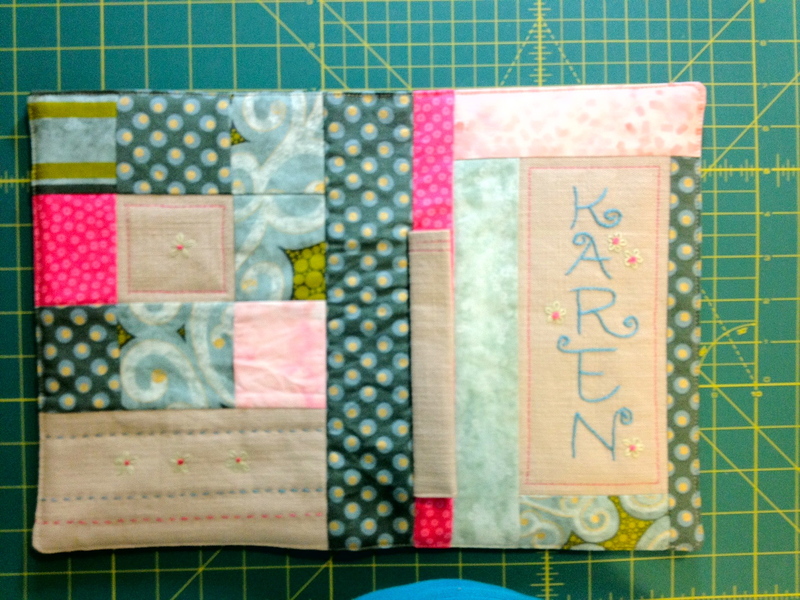 It is an original design by Candy Glendening as featured in “Quilting Arts Gifts” Holiday 2011/2012 magazine. You can figure the measurements to fit any notebook. I like to use a hard covered spiral notebook that I can buy at Staples for about $2.00. To personalize this gift, I put Karen’s name into a blank word document and played with some different fonts until I found one that I liked. 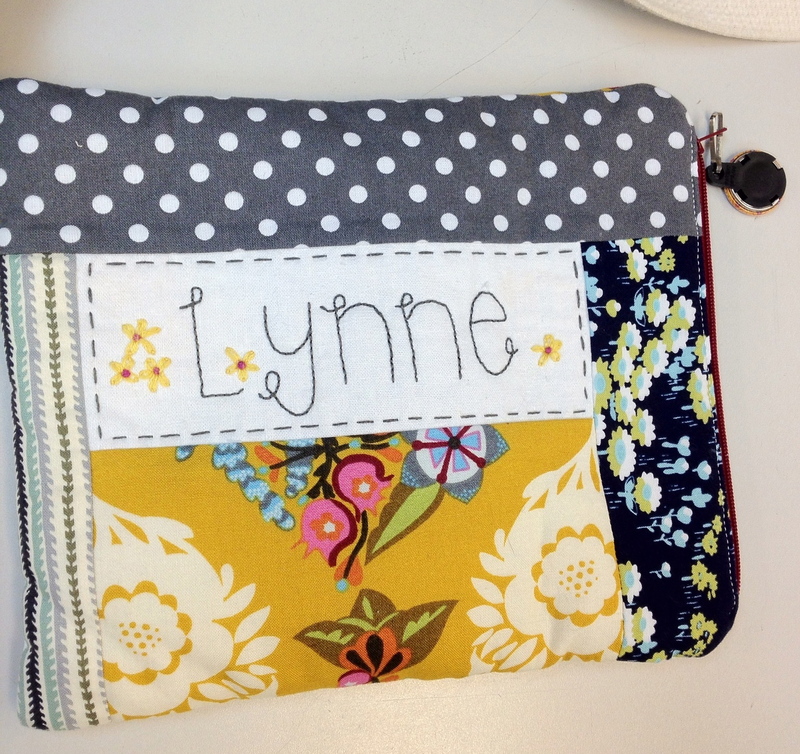 I then added the little “flourish” to each letter because I liked that kind of look on Lynne’s pouch. I freehand copied it with washable blue pen onto my piece of linen fabric. The embroidery was done with 3 strands of DMC floss and an outline stitch. Ready to be sewn to inside. The inside of this notebook cover has flaps to insert the notebook into. On the inside of the front flap is a little business card holder which I stamped a little design on. The inside of the back flap has a (green) pocket. Once the inside and outside pieces are all complete, the right sides are put together and stitched all around except for an opening in which to turn it. The final step is edge stitching all around the edge to close the opening and finish it off nicely. Karen loved it! And I loved having her visit. Happy Birthday tomorrow! Too cute!!! My favorite detail is the embroidered name. Freehanded it? Wow! It looks beautiful. Also I LOVE that little pen pocket on the OUTSIDE!!! I never would have thought of that and it’s fantastic!